Milwaukee, Wis. (May 28, 2013) – Born across the street from each other in Milwaukee, Miller High Life and Harley-Davidson have been making timeless American products for 110 years. Now they're making something together. 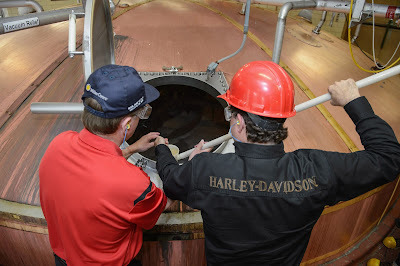 Today, Bill Davidson, vice-president of the Harley-Davidson Museum and great-grandson of Harley-Davidson co-founder William A. Davidson officially kicked-off a multi-year partnership with Miller High Life by helping brewmasters make a batch of the Champagne of Beers. "It's incredible to think that Harley-Davidson and Miller High Life were born on the same stretch of road 110 years ago," Davidson said. "This partnership and our 110thAnniversary events in Milwaukee celebrate our common bonds, our shared history and our bright futures." The beer brewed with Davidson will not be specially marked and will instead be distributed like any other batch of High Life brewed in the Miller Brewery. So this summer whenever someone celebrates after a great ride by enjoying the Champagne of Beers, they might be sipping this special batch. Harley-Davidson and Miller High Life will also keep some of this batch aside to celebrate special occasions with consumers throughout the summer. "It's an honor to brew a beer that has helped people celebrate the high points in daily life for 110 years," said Dr. David Ryder, Miller High Life head brewmaster. "But to share this moment with Harley-Davidson and the Davidson family is truly special." Beyond the unique batch of brew, commemorative Harley-Davidson designs will be featured on Miller High Life cans and packaging. The partnership will bring customized Harley-Davidson motorcycles with Miller High Life graphics to participating retail stores. The brands will also rev up excitement by offering fans the chance to win exclusive prizes throughout the summer - including Harley-Davidson commemorative apparel and a Harley-Davidson motorcycle. Fans can follow Miller High Life's Facebook page to get information on promotions and events in their area. 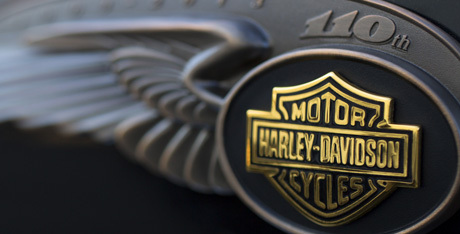 Now through the Harley-Davidson 110th Anniversary celebration in Milwaukee over Labor Day weekend, Harley-Davidson invites fans to showcase their favorite motorcycle rides this summer. Riders can simply go to www.h-d.com/110epicride and post their epic journeys. For more Harley-Davidson 110th Milwaukee event information and ticketing details, logon to www.h-d.com/110tickets. As part of the alliance, Miller High Life and Harley-Davidson will also encourage riders to take the high road this summer by sharing safe riding tips at motorcycle events across the country. Motorcycling enthusiasts will be able to take a pledge to be safe riders and enter for a chance to win incredible gear at www.MillerHighLife.com/responsibility. MillerCoors brews, markets and sells the MillerCoors portfolio of brands in the U.S. and Puerto Rico. Built on a foundation of great beer brands and nearly 300 years of brewing heritage, MillerCoors continues the commitment of its founders to brew the highest quality beers. MillerCoors is the second-largest beer company in America, capturing nearly 30 percent of U.S. beer sales. Led by two of the best-selling beers in the industry, Coors Light and Miller Lite, MillerCoors has a broad portfolio of highly complementary brands across every major industry segment. The company offers a variety of leading craft and import brands, including Blue Moon and Leinenkugel's, through its Tenth and Blake division. MillerCoors operates eight major breweries in the U.S., as well as the Leinenkugel's craft brewery in Chippewa Falls, Wisc., and two microbreweries, the 10th Street Brewery in Milwaukee and the Blue Moon Brewing Company at Coors Field in Denver. MillerCoors insists on building its brands the right way through brewing quality, responsible marketing and environmental and community impact. MillerCoors is a joint venture of SABMiller plc and Molson Coors Brewing Company. Learn more at MillerCoors.com, at facebook.com/MillerCoors or on Twitter through @MillerCoors. 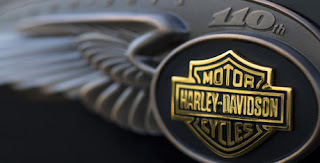 Harley-Davidson Motor Company produces heavyweight custom, cruiser and touring motorcycles and offers a complete line of Harley-Davidson motorcycle parts, accessories, riding gear and apparel, and general merchandise. For more information, visit Harley-Davidson's website at www.harley-davidson.com. Harley-Davidson fans are invited to learn more about the 110th Anniversary and join the celebration online where they can share videos, images and experiences on Facebook, Twitter with the hashtag #HD110, and at www.h-d.com/110. Big Bike Europe in de Messe van Essen van start!